I'll Bite: Hugh Acheson debates: When did Southern cooking change? Hugh Acheson debates: When did Southern cooking change? 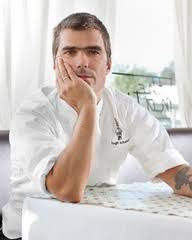 Athens, Ga., chef Hugh Acheson is a busy guy: "Top Chef" judging, "Top Chef Masters" competing, author of "A New Turn in the South" and executive chef of Five & Ten. Oh, and there are those two James Beard Foundation nominations, one for chef and one for his book. On top of all that, he has the reverence for Southern food of a devoted adoptee. He's not from the South (he's Canadian), so he appreciates it all the more. Acheson came up with a fascinating idea this week on the Epicurious blog, Epi Log: He looks at two recipes from two S.C. community cookbooks, one from 1961 and one from 1971, to determine when Southern cooking shifted from food prepared by a people who knew their way around their kitchens to food that was sliding into convenience products. Hugh Acheson's Southern cooking theory. I think he might have a point. My grandmother would have recipes like "Birds", starting with maybe a quail someone had given her. I don't know that I ever saw an instant soup packet in her kitchen. She had fresh butter delivered every week, fresh milk too. And it seems like she made everything from scratch, from bread to candy. Perhaps it is due to more women working full time jobs? How many of our grandmothers worked (outside the home)? Hugh Acheson is an overrated hack. How much do you love pimento cheese? Who won the sweet potato recipe contest?